This retractable bannerstand and a popular choice. It is lightweight and is set up or taken down in seconds. An affordable way to make a lasting impression and bring people in to your booth. You can even get multiple banners printed and interchange them within the hardware. 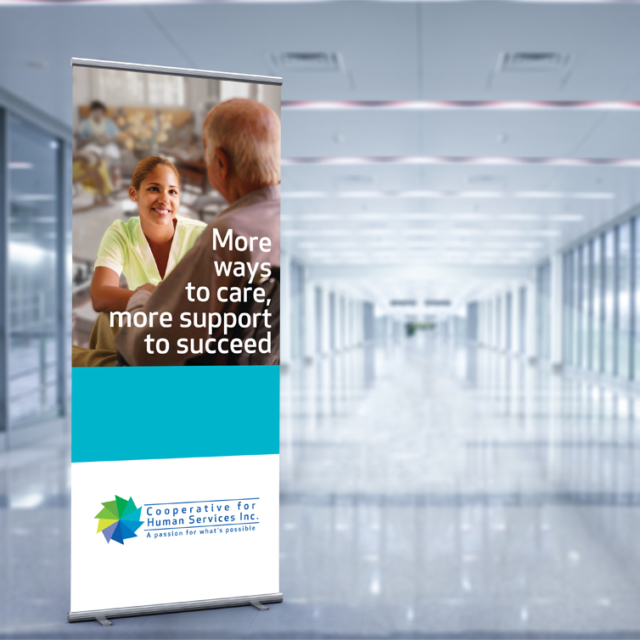 We recently designed and printed a retractable bannerstand for recruitment tradeshows for Cooperative for Human Services. Bringing in the branding we created digitally with their responsive website design, we used a photo that showed the care and dedication they have for the people they work with. We also provided copy writing services to come up with catchy headlines.